Can you believe? : "Is this a women's conference?" "Is this a women's conference?" Confession time: When I get a Christian anthology or conference announcement, I cannot help but scan quickly through the participants to see whether there's any kind of balance between men and women among the contributors. Maybe you do this, too! I don't claim that this is a reasonable or sophisticated measure of anything, but this has been my secret practice for probably most of my adult life. If gender balance is no perfect predictor of quality, why do I worry about it? I don't seek to be a hero on behalf of women. This concern is selfish: I love God and the church, but I don't love the religion industry. I don't love the many ways that the love of power and money has distorted Christian witness and suppressed spiritual gifts. As an adult convert who grew up in an atheist family, I keep hoping for evidence that this or that manifestation of church life is more than just the very tradecraft that Friends rose up to confront, and that helped keep me away from the church's door for too many years. Honestly, it's not that there aren't women who have become spokespeople for old-time oppressive religiosity--there certainly are. But conferences and books with a variety of voices are just more likely to have something fresh and expansive to say. 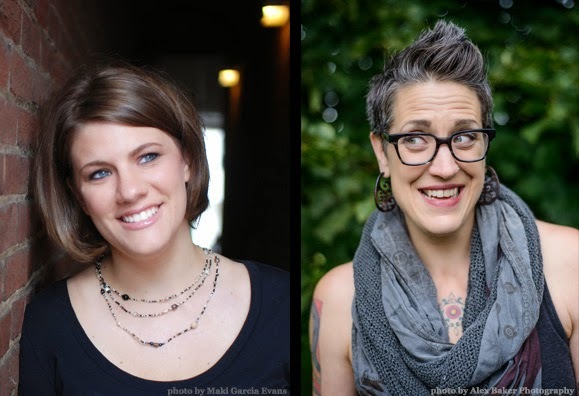 All this came to mind a couple of days ago when I read about a conference this coming September being led by Rachel Held Evans and Nadia Bolz-Weber with a 100% female group of headliners. This news story about the conference quoted Evans on the observation that the speakers' lineup "generates the question, 'Is this a women's conference?' Would an all-male lineup?" Can we already foresee the day when that question wouldn't be asked? Or, if we can't ... why not? Judy and I lived in Richmond, Indiana, twice--1982-90, and 1993-2000. During the first period, when I worked at Quaker Hill Bookstore, attended Earlham School of Religion and then began working for Friends World Committee, we were often invited to the weekly Yokefellow lunches at First Friends Meeting. Yokefellow founder Elton Trueblood had a vision of men (yes, in those years just men) coming together weekly in a fellowship based on the common ministry of daily work. Women cooked, served, and were welcome to listen to the speaker from the kitchen door. One of Earlham School of Religion's administrators won my admiration by turning every invitation down flatly: he wasn't going where his wife wasn't welcome on an equal basis. When I told Judy that I was planning to write about this experience, she added two things to the story: First, the women who served the lunch made a lot of money, which they themselves spent as they saw fit. Second, she reminded me of an incident I'd completely forgotten. One day there was a shortage of workers for the Yokefellow luncheon, and pastoral counselor Mike Brown asked her to pitch in for the day. She agreed, realizing that she was about 1/3 the age of the other servers (except Mike himself, who also often served) and intending to keep the whole thing a secret from me. Meanwhile, that very day, I was talked into attending by someone I couldn't refuse--namely that day's speaker, Elton Trueblood himself, if my memory serves me. I also intended to keep my attendance a secret from Judy. When we saw each other, we had a fabulous moment of sheepish delight. So much for my heroic consistency. ~ Can Ukraine's divided church help heal the divided country? ~ Top Moscow newspaper asks whether the USA was behind the Charlie Hebdo massacre. ~ David Oyelowo on the film Selma as a spiritual endeavor. ~ My top two favorite favorites lists: Nancy Thomas. John Wilson. ~ From cosmology to race relations: Marilynne Robinson on Edgar Allen Poe. More traditional forms of blues return next week!